Two separate petitions on the subject of electoral reform have been published in Hong Kong’s leading Chinese newspaper. One urged the public to support the government’s electoral reform package, whilst the other called upon Hong Kongers to reject it. Under the title “Let’s move forward,” the petition in support of the reform package was undersigned by prominent former officials including Ronald Arculli, former Convenor of the Executive Council; Frederick Ma, former secretary of commerce and economic development; Joseph Yam, former Chief Executive of the Hong Kong Monetary Authority, and others. The petition expressed the view that support from two-thirds of the Legislative Council is all that is required for the resolution to pass and Hong Kong needs to be united and move forward. “Standing still is not an option,” it stated. Conversely, another signature campaign appeared in the Ming Pao initiated by academics and professionals under the heading, “Standing Firm on Hong Kong’s Core Values – Veto Sham Universal Suffrage, Guard Against Authoritarian Rule.” It asked for the public to support vetoing the political reform resolution. 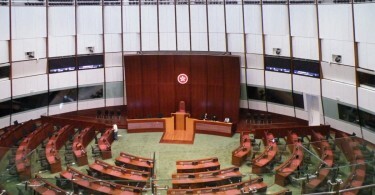 The campaign has gathered around 1,900 signatories and declared that Hong Kong’s core values are being eroded, and the Central People’s Government has twisted the interpretation of “One Country, Two Systems.” The campaign asked for Hong Kong people to recognise the lies behind accepting the reform resolution. The campaign was initiated by academics such as Michael Davis, professor at the faculty of law at the University of Hong Kong; Albert Lai, current chairperson of the Professional Commons; Cheong Ching, veteran journalist, and others. The controversial political reform resolution is set to submitted to LegCo on Wednesday and due to be voted upon within this week. With the pan-democratic legislators standing firm, it has appeared increasingly unlikely that the resolution will obtain the required two-thirds majority within LegCo to pass.